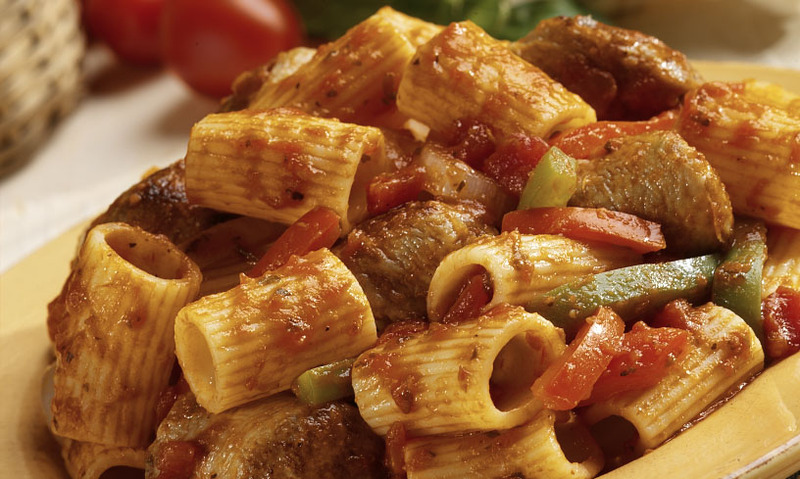 Our Italian Sausage Links and peppers are a traditional topping for this hearty pasta. Cut Bob Evans sausage into 1-inch pieces. In large skillet, cook sausage and peppers until sausage is brown. Stir in pasta sauce and crushed red pepper. Bring to a boil, reduce heat to low and simmer for 15 minutes or until sausage is cooked through. Stir in cooked rigatoni. Serve with grated mozzarella. * Can also use Bob Evans 1-lb sausage roll. 1 Cut Bob Evans sausage into 1-inch pieces. 2 In large skillet, cook sausage and peppers until sausage is brown. 3 Stir in pasta sauce and crushed red pepper. Bring to a boil, reduce heat to low and simmer for 15 minutes or until sausage is cooked through. 4 Stir in cooked rigatoni. Serve with grated mozzarella. * Can also use Bob Evans 1-lb sausage roll.